The Paris edition of Architect at Work is set to take place on the 19th and 20th of November this year. 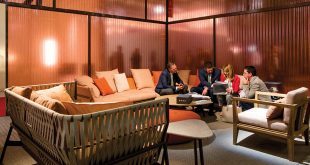 An event for architects, interior designers, designers, property developers and more, it focuses on ensuring optimal contact between exhibitors and visitors through its unique layout. Presenting innovative products, materials and applications, emphasising the exchange of ideas and knowledge and enabling the meeting of relevant specifiers over the short period of just two days are the main features of this event. Architect at Work Paris will be featuring an exclusive line up of artists besides offering a number of stimulating seminars. Belgian artist William Sweetlove’s sculptures will be on display as well as the work of photographer Pierre-Olivier Deschamps comprising twenty shots of industrial sites that highlight atmospheres so specific to architecture. Seminars include Le BIM et l’Architecture on the first day and Matières à histoires held by architect Hervé Beaudoin on the second.